Dawn... I've got to be there by dawn. But no, the work doesn't wait, and I'm already running late. I arrive to a paddock that seems still mostly asleep. I park, don my gear, and start looking around for pictures. This was frame number 9. 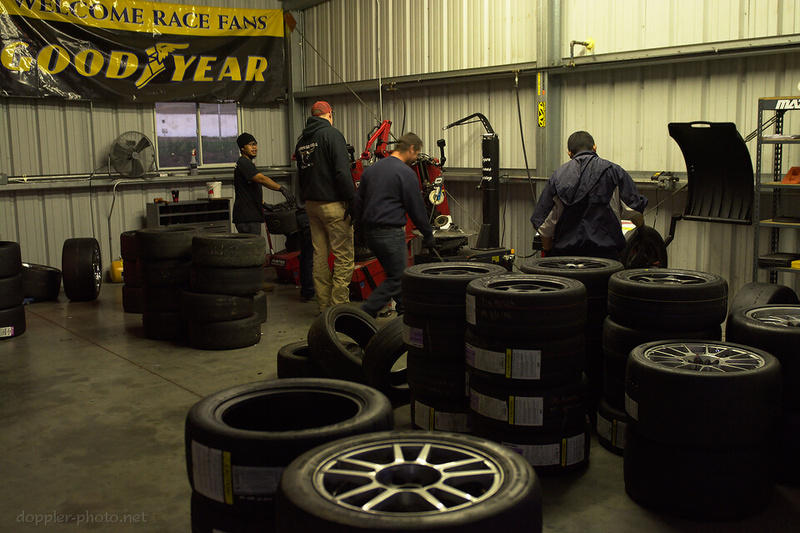 The AIM Tire crew was already motoring in high gear, because the work doesn't wait, and tires make the race go 'round. I mentioned in "Fractal Nature" that during pit stops, teams strive for a subtle balance between speed and precision. 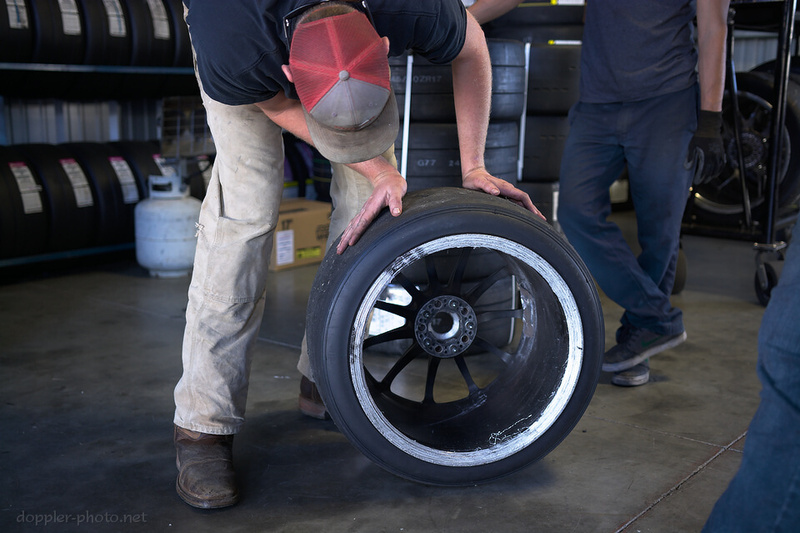 Tire workers aim for a similar kind of balance. Too fast and you make mistakes: ding a rim, misbalance a tire, or worse. But too slow, and you just don't keep up with demand: new rubber doesn't get swapped onto old rims by the time that the teams need them. Work starts to pile up, and as the workers grow tired, the stacks just grow and multiply. 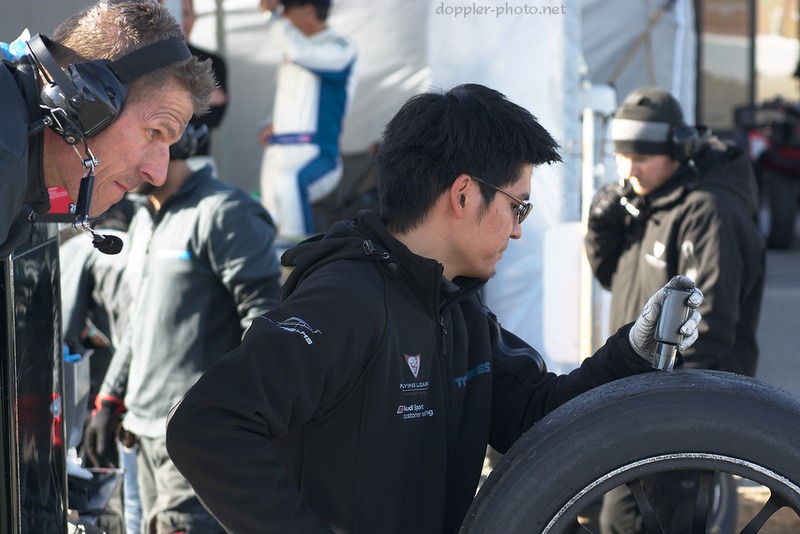 Tire management is also a balance for the teams. Time spent doing pit stops takes away from time actually turning laps. But time spent limping back to the pits after a flat can take even longer. And even before the flat tire phase, the tire's performance will degrade as the soft, high-grip rubber is worn away and the harder, innermost layers of rubber are exposed. Those layers are meant to protect what's left of the tire, rather than to provide as much traction as the outer layers. 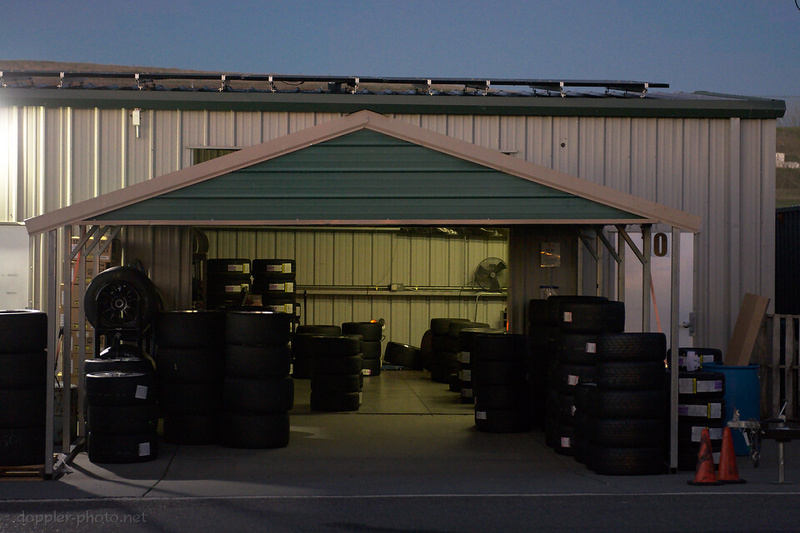 Another aspect of the challenge is that with the car out on track, the teams can only estimate tire wear. Thermal conditions, mechanical issues, variations in on-course traffic, driving styles and/or mistakes, and a host of other factors can cause the tires to wear more quickly or more slowly than anticipated. So a lot of teams use special tools to measure the remaining tread depth of the tires coming off the car, in order to check and correct their estimates. Even so, they'll often play the game somewhat conservatively, because a flat tire can end up damaging bodywork, which will take even more time to repair. But sometimes, a team decides to push that balance all the way to the extreme. After showing up to the track, the Ryno Racing team decided to enter their spare-parts car into the race. 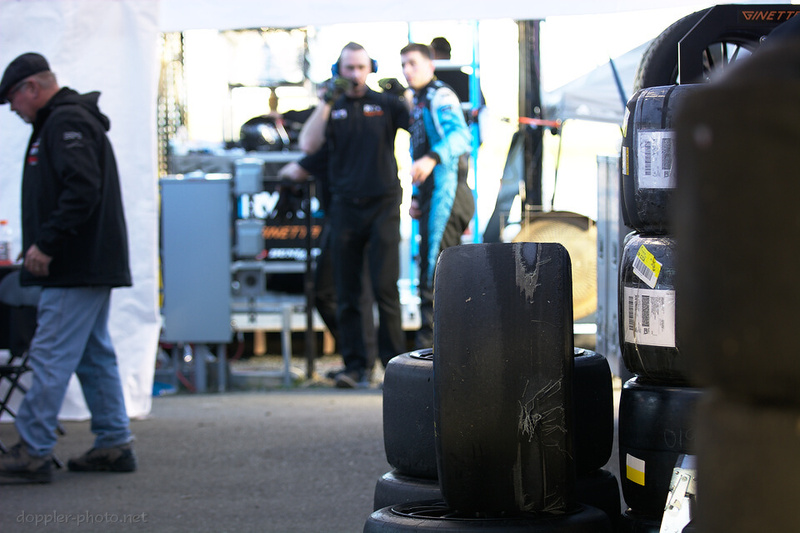 According to team members, they had to scrounge together a team of drivers from folks already at the track, and they ended up trying to squeeze the remaining life out of already-used tires in order to actually get the second car around the track. The tire in the photo is one possible result of a strategy like that. In the over-worn patches, you can see that the fabric cords have been worn away, and the steel cords (which provide a lot of the physical structure of the tire) are exposed. As the structural layers start making contact with the ground, the tire loses grip and mechanical stability, and becomes dramatically more likely to develop a flat. 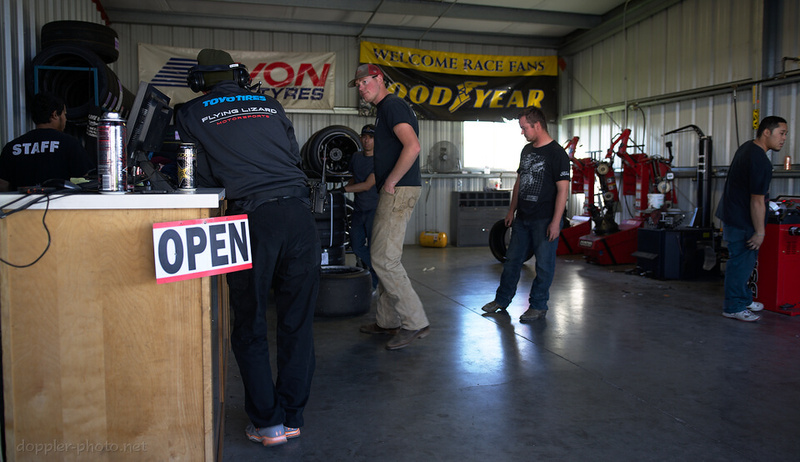 Tire-related maladies aren't limited to just the race cars, however. 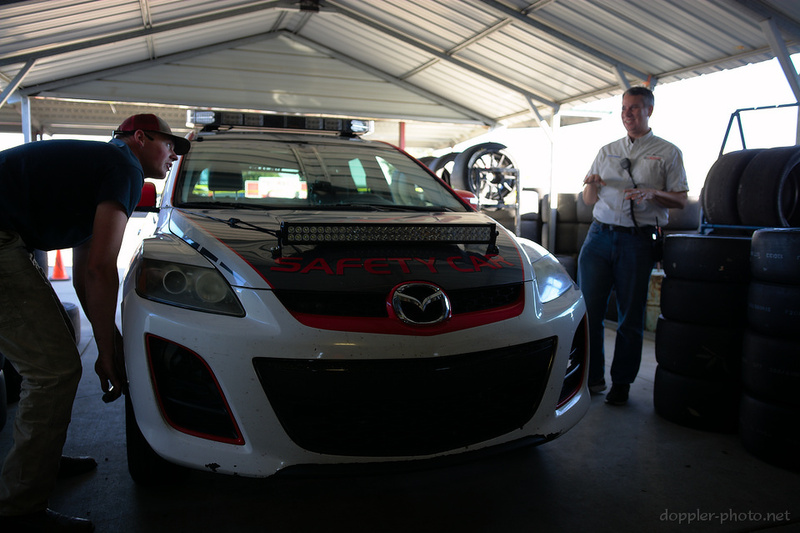 I was hanging out at the AIM Tire shop when the safety car pulled up, with the driver reporting an alarming wheel vibration while out on track. It turned out that the lug nuts on the front-right corner were only on finger tight by that point — a few more laps and the wheel would've come off. But when the race throws you a curve-ball, experience helps you to handle it in stride. The safety car driver knew a wheel vibration when he felt it, and one of the AIM folks went through and retorqued all of the lug nuts, together avoiding what would've been a pretty ironic mini-disaster. So if a tire ends up mounted on the wrong rim, this is how it can end up. In this case, the front tires in that set were mounted on the wider rear rims, and the rear tires were mounted on the narrower front rims. By the time the driver noticed the issue, they still had to finish the lap to get back to the pits. The wide rims rubbed on the car's front control arms, causing significant damage to the inner lip of the rim, as seen in the picture. The front rims didn't have enough clearance for the rear brake calipers, and so the brake caliper faces were… uhh… machined slightly, but were still functional enough to stay on the car. But this highlights that the ultimate balance in motorsports is risk management. Especially in an endurance race environment, everybody can make mistakes, and everybody's risk management strategies are slightly different. One of the things that makes a consistently great team is being aggressive enough to actually get out in front, while being conservative enough to catch most of the important mistakes, and having enough resources and experience to accommodate the ones that you don't catch. In the grand scheme of things, this was just a road bump on the #45 car's journey to the top spot on the podium, for the second year in a row. Make sure to catch the next chapter, on pit stops and the race marshals who oversee them. Click here to subscribe, and don't forget to share!